'The Grateful Dead Movie' will see its first-ever Blu-ray release on November 1. Disc 2 is a DVD containing more than 95 minutes of bonus concert footage, including “Uncle John’s Band,” “Sugaree,” “The Other One‚” “Spanish Jam‚” “Mind Left Body Jam‚” “Scarlet Begonias,” “China Cat Sunflower‚” “I Know You Rider,” “Dark Star,” and “Weather Report Suite.” Also included in the bonus features are the option for visible lyrics, a feature-length commentary with supervising editor Susan Crutcher and film editor John Nutt, the documentary films “A Look Back,” “Making of the Animated Sequence,” and “Making of the DVD,” the television commercial for the Mars Hotel album from 1974, multicamera and multitrack audio demonstrations, and an extensive photo gallery of production notes, photos, film stills and other historical items from the Movie’s production. Additionally, viewers can choose which sound mix they want, including a 5.1 DTS HD Master Audio presentation of the original theatrical audio mix, a DTS 5.1 audio mix, mixed from the master multitrack tapes, or the PCM 2.0 audio mix, all from the master multitrack tapes. The bonus songs were transferred from the 16mm camera-original film negative, with audio from the master multitrack tapes offered in both a Dolby Digital 5.1 audio mix or Dolby Digital 2.0 audio mix. The legendary Grateful Dead Movie is known for its remarkably intimate look at the band and the Deadhead scene of the time. Now fans can enjoy the film in high definition as never before. Fans who preorder 'The Grateful Dead Movie' directly from Shout! Factory will receive an exclusive bumper sticker with their order, while supplies last. Additionally, it will ship on October 18, two weeks before being available in stores. For more info, visit: www.shoutfactorystore.com/prod.aspx?pfid=5257509. 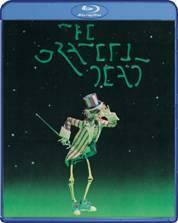 'The Grateful Dead Movie' is the first in a line of Grateful Dead films slated for release by Shout! Factory in collaboration with Rhino Entertainment. Future releases will include The Closing Of Winterland, Dead Ahead, Truckin’ Up To Buffalo, Ticket To New Year’s, Downhill From Here, View From The Vault, View From The Vault Vol. 2, View From The Vault Vol. 3, View From The Vault Vol. 4 and So Far, a 1987 film that has previously only been available on VHS and laserdisc. You can find the latest specs for 'The Grateful Dead Movie' linked from our Blu-ray Release Schedule, where it's indexed under November 1.